All transport between the worlds of the Commonwealth happens through space. The vast, empty expanse of the Hinterverse is an inhospitable place, and travel is not without jeopardy. For one, a human body lost in the empty sky will freeze to death within minutes. If they have access to air. Modern space vessels are divided into two main categories, closed hull and open deck. Most military and long range vessels belong to the first category, as it allows the crew to access most of the ship systems without risk of life or wearing bulky atmosphere suits. Open deck vessels are primarily used for shorter travel. Sun-sail ships are most commonly open deck and their crews can only work the rigging for short periods of time without environmental gear. Blasma boiler​, or tea-kettle. A plasma boiler superheats steam which is released through directed nozzles, propelling the vessel through space. This is the most common type of propulsion for inter-world travel as it is both faster than other methods and it allows for a closed hull configuration. Sun-sail​, or rag-and-torch. The ship gets power from sails that capture the light of the stars. This light is transformed into energy by lux reactors and powers the ships thrusters. These vessels are capable of inter-world travel, but at a slower speed. Sun-sails also rely on trimming by crew and all but a few such ships are open decked. Gyroscopic screw​, or whisk. Usually found only on smaller vessels, or as a backup system on larger ships, this method reliesnon inertia to steer a drifting vessel through the vacuum; the gyroscope can maintain or change course, not alter its speed. A vessel relying solely on this drive system will not be able to take off from a gravitational body. Otomo-sphere​, or power ball. 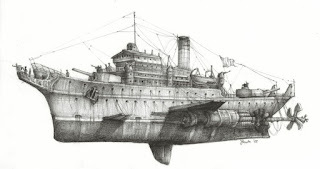 Another form of propulsion mostly found on smaller vessels. High pressure superheated steam is forced into a spherical container which is connected to the vessel’s thrusters. Though the range is severely limited, the fact that it allows for gravitational take off, as well as speed changes in flight, makes this a popular choice. Combined drive systems​ are very common. Most vessels will have a gyroscopic screw as a backup and to aid with maneuvering. The Otomo-sphere is another common backup, as it can essentially store power until needed. Short range vessels often combine these two.